Journalism students will be thrown in at the deep end this week as they join forces to produce their local weekly paper. 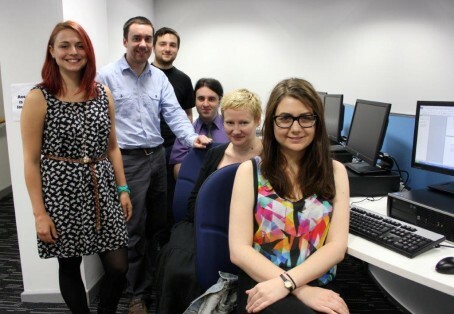 The seven print and magazine trainees, from Leeds Trinity University, will join the Morley Observer for a week from Wednesday, taking on lead roles in producing the news agenda for the week. The group – dubbed MOJOs (Morley Observer Journalists Of the future) – will have to generate their own stories, write them up, and upload them to the website, giving them a taste of life in a real newsroom. Group editor for the Dewsbury Reporter and Morley series, Hannah Ridgeway, said she was looking forward to welcoming the students. “As journalists ourselves, we all understand how crucial it is to gain quality professional experience, so we’re really pleased to be able to work with the university to give the students this opportunity,” she said. “We will be asking them to cover news and features for us and to take a students’-eye view at our town and its people. A number of feature stories have been earmarked for the trainees, offering them the chance to secure a big splash for the week’s edition. The university’s senior print journalism lecturer Lisa Bradley said if successful, she was hoping to make the experience an annual event. “I’m delighted that the Morely Observer has shown so much trust in our students and the course by bringing them all on board for the week, and I’m very grateful to the news editors and reporters who will be working with them,” she added. Times have changed since Stuart Welham patrolled the Morley beat. Any Leeds-based newspaper hacks remember him?